Increased focus on the study and science of sleep has made millions of people more aware of how important a full night’s sleep is to their health, as well as the importance of proper body support in getting that sleep. At the same time, the world of design and manufacturing changes at a pace that can leave you behind in the blink of an eye. To stay ahead of trends in both of these areas, The Foam Factory has incorporated a new machine into its fleet, capable of producing cutting-edge comfort and support products. The Foam Factory’s new compression cutter, sometimes called a foam profile cutting machine, utilizes precision-routered templates to design contours and patterns in a range of products that provide individualized body support, styling preferences or both. Melding the characteristics of a die-cutter and convoluter, the compression cutter, true to its name, compresses foam over a template while a horizontal blade slices through the foam. The different pressure levels generated by the compression over the template results in a mirrored reflection pattern in the foam. This makes the machine capable of generating smooth or sharp angles in designs that would be impossible to replicate by hand. Depending on the product being created, a single run of the machine can produce two end-products, and by flipping the foam after a run, products can have two-sided custom designs as well. The capabilities of this machine are best reflected in foam mattresses with the creation of comfort zones that provide varying levels of firmness and softness where the body needs it most. The Foam Factory’s compression cutter features a special-order extended table with an operation area 79 inches wide and 85 inches long. This allows for the creation of even the largest bed size with comfort-zone detailing. 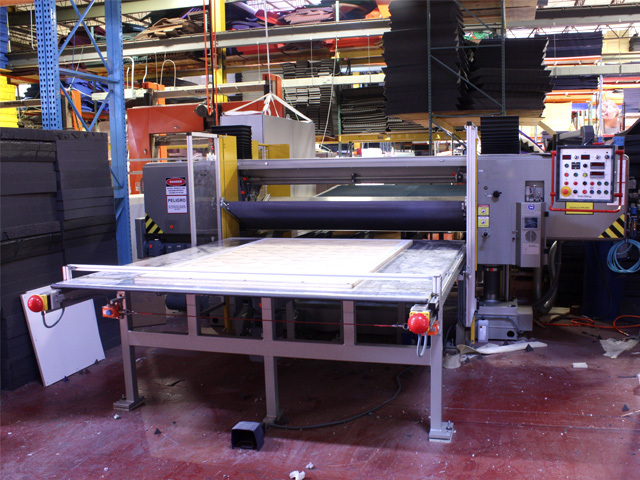 The cutter can cut sections of foam up to 9.8 inches thick in a single pass, and with the option to laminate foam materials together, mattress thickness is virtually unlimited. Mattress toppers are cut using the same process but in lesser thicknesses to customize the comfort of an existing bed or mattress. Foam bedding is well-known for its comfort and pressure-relieving characteristics that cradle the body and improve circulation. Traditional mattresses may support one area of the body properly, but can leave other areas over or under-supported. The ability to create comfort zones in mattresses and mattress toppers further increases the customization potential of The Foam Factory’s product line. Body regions that require the most support while sleeping, such as the shoulders and hips, are able to have patterns designed that provide the most support, while areas like the feet and lower legs that require less can have more cushioning designs added, all in the same mattress. Some patterns are even designed to allow additional airflow to keep users cooler, making their bed more comfortable. Nearly all of The Foam Factory’s open-cell polyurethane foam materials can be used with the compression cutter. This includes their full line of traditional open-cell foams, their three, four, and five pound memory foam densities, specialty Dryfast foam for outdoor or marine uses, and versatile charcoal foam in regular or firm feels. The Foam Factory has also put their compression cutter to work furthering the development of their acoustical foam sound treatment line. Large panels of sound treatment can be created, and new, unique motifs are being designed to provide customers with one-of-a-kind style for their studios or work spaces. 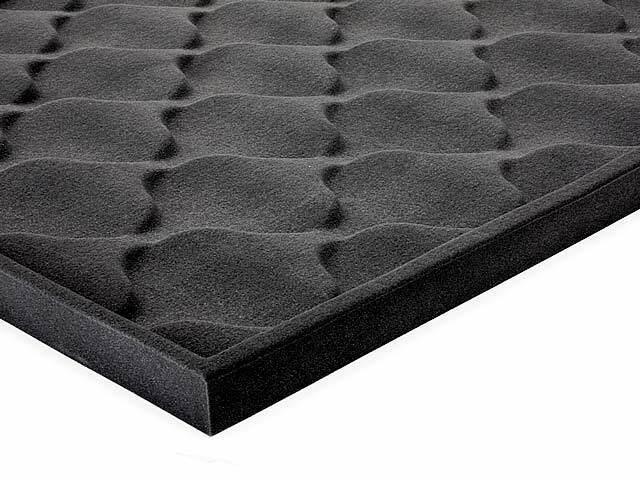 New design offerings include basket weave Acoustic Grid, rippling Acoustic Spade, and free-flowing Acoustic Wave, in addition to the popular standby eggcrate foam and wedge and pyramid foam sound tiles. 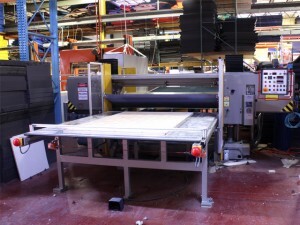 The Foam Factory manufactures all of their templates in-house, using their CNC router to create the laminated particle board forms with computer-controlled precision. With no need to outsource the creation of these templates, lead times and costs for products are greatly reduced and the potential for miscommunication and confusion is minimized by reducing the number of companies, individuals and processes involved to make a template and product. The Foam Factory even offers the creation of custom templates depending on the size of the order and the feasibility of the project. For creating packaging runs in the tens of thousands, long-term orders that will be need to be repeated frequently, or even jobs for other companies looking to design their own products that don’t have the machinery to do so, the option to create a custom template exists. One of The Foam Factory’s goals is to be a leader in product innovation and capability, while providing products at a price that makes them accessible to everyone. The addition of their compression cutter only adds to their manufacturing capacity and product lines, making production easier, faster, and ultimately, more affordable.